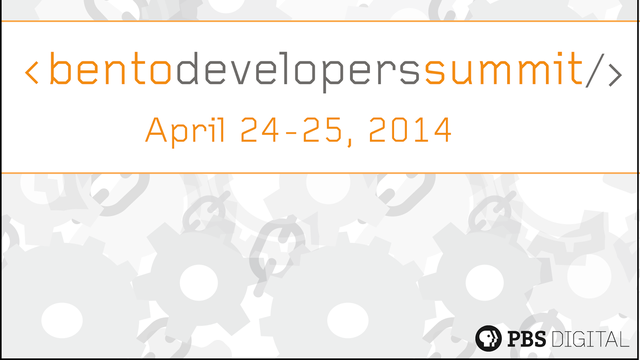 On April 24 and 25, PBS Digital hosted the first ever Bento Developers Summit. This two-day conference was designed to promote the best parts of collaboration. Roughly 20 Bento and non-Bento stations attended the meeting, which included some of the system’s best web developers, front-end designers and digital leads, to join forces with PBS Digital’s design, product, and station teams. The attendees represented all aspects of public media, from large to small stations, dual licensees to state networks. The Public Media Platform group also presented an update on their work and how it could be implemented while developing code. The agenda was modeled after popular “hack-a-thon” style events used by tech companies and organizations to educate staff/members while promoting social interaction and furthering the goals of a particular product or service. All attendees were required to submit at least one project they wanted to see built and integrated into the system. Throughout the project submission process, roughly 50 projects were submitted for review. Of those projects, 6 were selected and pitched at the summit by the stations. Other attendees could then sign up for projects they’d like to work on. After two days of building, stations were then asked to demo their final projects to the rest of the group in an informal Q&A format. As a result of the hard work the groups put out and popularity of the finished product, Digital will be integrating several of the projects into the official Bento product roadmap. To promote all of the projects worked on during this time, the SPI team is going to be sharing this code on the new Open Bento GitHub project. If you’d like to view the code that is currently available, contribute new code, or would like to keep tabs on any new projects that is added, view the Open Bento GitHub project here: https://github.com/OpenBento. In the spirit of collaboration, there will also be a lunch and learn where stations will get the opportunity to present their work and have other stations ask questions. With the success of this developers summit, PBS Digital looks forward to hosting more conferences like this in the future.